When I think about art projects for kids, I instantly recall the time my 4-year-old daughter spilled a plastic container of paint over the head of our new Jack Russell Terrier puppy. The painting project I had carefully planned and organized evolved into a very long afternoon of complicated cleanup. Needless to say, neither I nor the puppy was amused. Most parents can recall these kinds of stories about their young children’s messy and often chaotic home art projects. For kids, the temporary mess and disorder are only a small part of the story. Developmentally, art projects open windows to kids’ lifelong creativity. Even if children don’t display extraordinary artistic talent, art projects for kids at all stages of ability have been shown to contribute to their sense of aesthetics, imagination, ingenuity, inventiveness, and originality. 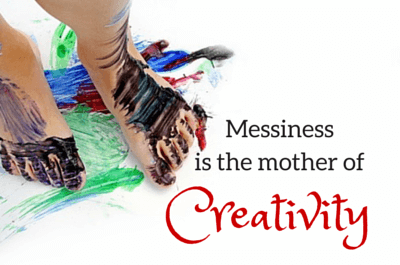 Messiness is the mother of creativity! Let your child get messy. Creativity evolves from chaos and disorder. So be ready for the cleanup and consider it an important part of the process. Think of art projects for kids as play opportunities. When art is experienced as a creative, playful process children feel internal rewards from the doing, not just from the end results. Help children take pleasure in the creation of art by praising them for their hard work, perseverance, and ingenuity. When parents emphasize the product over the process, kids’ interest in art quickly diminishes. Help kids see art in nature. Art is all around us, and many would say Mother Nature is the ultimate artist. 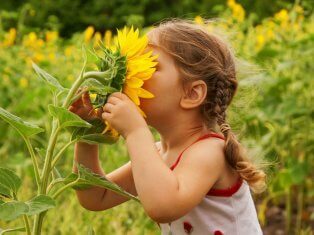 Research shows that connecting to nature is linked to a child’s lifelong happiness. When pondering art projects for kids, consider using natural materials that your child has gathered outdoors and can manipulate in creative ways. Celebrate your child’s differences. The beauty of art and aesthetics is in the eye of the beholder. Art allows us to experience people who see, feel, and understand differently from others. Encourage children to express their differences through art and praise them for their self-expression. Create a relaxing and reflective environment. Think of art projects for kids as food for their souls. Create a relaxed, no-pressure environment for them to soar. Help kids connect artistic experiences with their feelings by asking questions like, “How does what you just created make you feel?” These types of questions nurture self-awareness. The Artful Parent – This is a wonderful blog with over 500 ideas for art projects for kids. The activities are searchable by category and range from painting to sculpture ideas to stained glass. Education.com – These art and craft activities cover a wide range of subjects for young artists, future sculptors, potential puppeteers, and all things creative. Enchanted Learning – Extensive crafting options that include materials found around the house, like egg cartons, cardboard, paper, boxes, string, crayons, paint, glue, etc. Also includes holiday themes. Family Education – Discover dozens of creative arts and crafts ideas you can do with your kids, including homemade gifts, holiday ornaments, home decorations, and more. Kid Spot – You will find art projects and craft ideas for kids of all ages. Projects contain step-by-step instruction and age ranges. PBS Parents – Choose art projects for kids from clay to crayons, and paint to pipe cleaners. Looking for a craft to tie in with reading or math? This is the site for you!